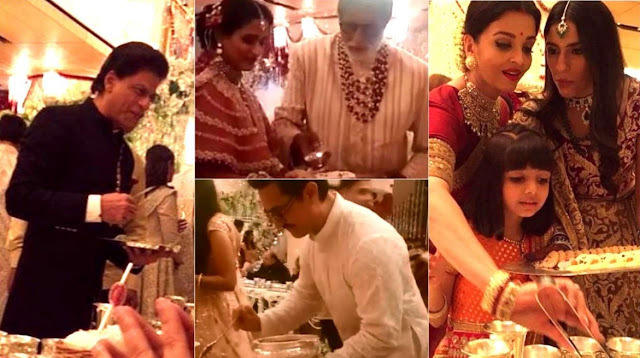 Bollywood Stars Serving Food At Isha Ambani Wedding: The videos were seen in which Amitabh Bachchan and Aamir Khan were seen serving food at the wedding of Isha Ambani and Anand Piramal. Seeing these videos became viral on the internet. After that, some such pictures have also been revealed, in which Aishwarya Rai Bachchan, Aaradhya Bachchan, Abhishek Bachchan, and Shahrukh Khan are also seen serving guests. In pictures, Shahrukh Khan has seen guests interacting with them while serving food. Shahrukh Khan is seen as a perfect Ladkiwale in these pictures. Anyway, Shah Rukh is counted among the best housewives in Bollywood. Aishwarya Bachchan is also sharing the sweet sweets in the sari of Sabyasachi on social media. Aaradhya are also seen with them. In addition to these two, Abhishek Bachchan has also seen guests serving food to Isha's wedding. Seeing these pictures, it seems that the entire Bollywood has become the Ladkiwale in Isha Ambani's wedding. Let us say that this marriage took place on December 12 in Mumbai at Mukesh Ambani house in Anitila. Prior to this marriage, there were also functions of pre-wedding in Udaipur, which included close friends and family members of the Ambani family. Besides the big stars of the pre-wedding function, Beyonce also came to India to perform. On Friday, Isha and Anand had their wedding receptions, in which almost all Bollywood stars were present, including Diar Mirza, Boman Irani, Hema Malini, Jitendra, Ekta Kapoor, and Kartik Aryan.